Why is the Dunder Mifflin mission statement on the restroom door? 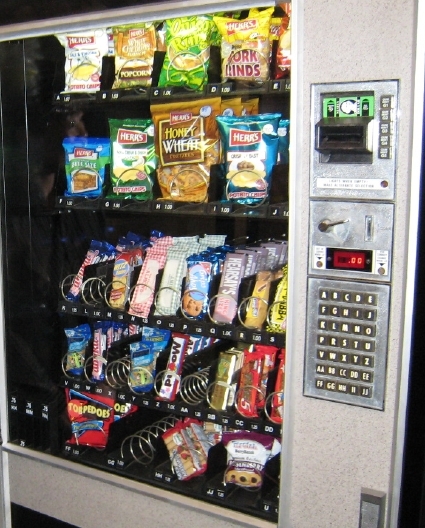 The vending machine is stocked with various varieties of Herr’s chips, as well as snacks like Hearsay’s chocolate bars and Grips Ahoy cookies. Toby’s desk. Notice his daughter Sasha’s photo. Adorable! Toby Flenderson’s certificates of achievement. Yay Tanster! So amazingly dawesome! Thanks for all the pics! There’s actually a Green Street in Scranton, PA! unfortunately theres no 8103 green street… but cool enough! oh man, gotta agree with luke, totally dawesome pictures! thanks for sharing them with us! lol imagine Greg Daniels seeing that photo every time he goes in his office. what’s creed doing with his hand in the pic with you? it looks like he’s in the middle of explaining something, did his character think you were a new employee? I’m losing all hope this season and starting to feel like nothing will ever happen with Jim and Pam. You gotta give us some details from filming, even just little tidbits, throw the fans a bone! We can’t all be as lucky as you! In case anybody was wondering, the Chinese characters under Creed’s picture are supposed to be 你好 (which means hello), but due to poor penmanship came out looking like ㄒ尔女子 (sh, thou woman). Gosh, I hope those Chinese characters come through okay. jennie you gotta get that picture with JK blown up 20×30″ and get it framed! truly great pics… i’m more of a nerd for the technical aspects of a show and loved the pic of you with with Sony HD cam they use. Roy’s pay check on Angela’s desk. That’s realism. Jennie/tanster, thank you for posting these wonderful pictures. I am really struck by the warmth all the cast project. You are soooo lucky…but then, so are they!! Those pictures are priceless! Did you take any videos? I can’t imagine how excited you must have been. I agree with nspector,That’s Realism. Tanster, that is so great, excellent photos! :) I’m so happy for you, you’ve totally deserved all of this after the amount of work you put on this website. Such awesome photos! I’m over my jealousy (mostly), and now I’m just plain giddy with happiness for you! More! more! It’s always nice when something nice happens to the nice (gotta love Frank Burns). I enjoy visiting your site, and this was payback for all the great info you send out. BTW, is anyone else BLOWN AWAY by the incredible detail that goes into furnishing and decorating that set? I mean, a paycheck for Roy on Angela’s desk? Simply marvelous! 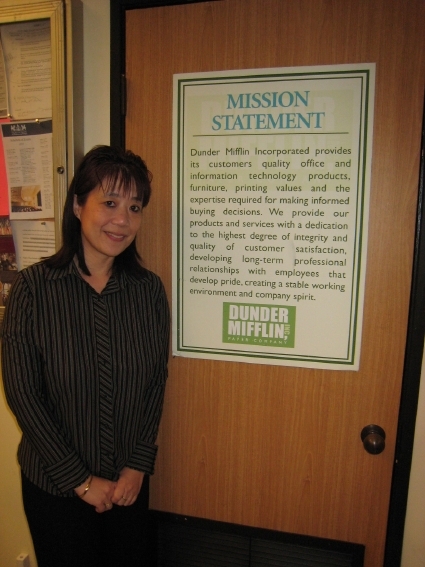 Thanks for sharing…both you, GMMR, and the gracious “The Office” cast. Very cool. Awesome pictures!! I’m looking forward to reading the whole report later on!! I see the answer to the Mindy question. oops! Silly me. I’m serious though about ryan/Kelly. You find out any spoilers you can share? I have to say, the detail that is grabbing me the most is Karen’s poor pathetic nameplate on her desk. Where only she can see it. One last vestige of fancy Stamford that she’s holding on to. Poor Karen! Okay, that’s aside from Roy’s paycheck. That is DETAIL! NICE! Thank you so much for sharing your day and experience with us! Have a great time at Paley! Awesome pics!! Thanks so much for sharing! I can’t wait to read all about it. thanks so much for posting these pics! how incredble for you. it must have been a surreal experience. after posing with JK i think i would have died and gone to heaven. what a cutie. how could you stand it??? Oh my gosh, what great pics. I can’t believe how many there are ! You really did a great job ! WOW…you met Jim and Dwight !!!! Thanks so much for sharing, tanster! This made my morning. I’m looking forward to the full report. It looks like Angela is wearing that same horrible blouse she wore in A Benihana Christmas (or at least something similiarly white with a high collar). And I watched Branch Closing last night and noticed something in the scene where Angela and Kevin are arguing about which restaurant they should go to for Phyllis’s Last Lunch. 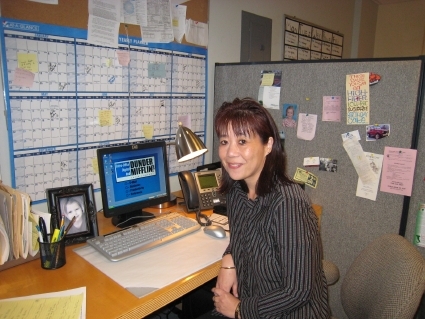 I pretty sure I saw the same yellow post it note that is in the picture tanster posted of Angela with OT on her office computer. In Branch Closing it was taped to the glass divider between Angela and Kevin. It appeared to have the same written note on it. Maybe I’m wrong, but it looked the same to me! Thanks and congratulations again, tanster! Those pics are awesome! I am so jealous of you. I love the writing on the whiteboard. They seem like such nice people. So awesome! I would’ve been SO nervous meeting Steve… ahhhhh! that is so awesome! i love all of those photos! yeah, the detail is amazing! the props department and set decorators must have so much fun with getting the set ready! you are so lucky that you got to meet the cast! all the actors seem so sweet and gracious! that is so refreshing :) have fun at the paley fest! so you probably can’t tell us, but you were an extra on the show that day, right? maybe a customer coming back to DM after the whole internet thing fizzled? Tanster!!! Look at the pic of you and gorgeous John…little head leaning going on there…you are swooning!!! You look different in that picture than in any of the others. God is he a charmer. Of all the photos online of John K, I think this and the one over on GMMR are the best. And you looked nervous as you said you were meeting Steve. But in a good way. You have lived out the fantasy of everyone who comments here. You totally delivered. So does John smell good too? I bet he does. And I might add you looked quite fetching yourself. How fun was this for you!!!!! Oh how fun would that have been?! Wow, thanks for sharing the pics with us Jennie. It totally made my morning, haha. You are so lucky to have met the cast! And I must say – John looks hella fine in those pics with you, hehe! Especially that one with you and Jenna… =D Can’t wait to see/read more. Speaking of JK, look at the number beside his name on the right side of the page (insert Kevin’s “tee-hee” laugh here). I am loving these photos! I’m so happy for you and both of you deserved it! Your pictures are so awesome! So it looks like Andy is back from anger management training and still wearing the same loud ties. What episode were they taping when you were there, i.e. how many episodes past “Cocktails”? LS, the episode we watched being shot was, I think, either four or five episodes after Cocktails. how good is NBC for doing this? Thank you SO much for sharing those photos with us! Your photos with the cast are adorable, but I especially love all the close-ups of the desks and props, it’s a great look into the world of Dunder Mifflin. You’re the best! Andy’s back! Andy’s back! Andy’s back! I wonder how his anger problem is. Did he get out in five weeks instead of ten? What wonderful pictures- thanks for sharing your amazing day with us. Good for you! What a wonderfull opportunity presented to you. It is so evident that the natural “chemistry” the cast/crew display, and the strong loyalty to their fans off camera is such a strong contributing factor to the success of the show. Hats off to the folks of “The Office” for providing the time and generosity. And thanks to you for sharing what has got to be a highlight of a life time. Quick question… Which one was Pam? Thank you SO much Jennie, for sharing those!! Looks like you had a great visit. Hilarious. Best Creed moment (according to me and JK)… Made me laugh. And awesome pictures! The original bobblehead doll doesn’t look exactly like the mass produced one, I noticed. Thanks for sharing! Love these photos! Ed Helms looks so adorable! Be still my heart. Thanks for sharing with us. Question … Steve Carell looks like the only one who isn’t in his usual Office wardrobe. Was he just not dressed for work or was he being Office casual? How did you ever get permission to tour the set? Who do I call? 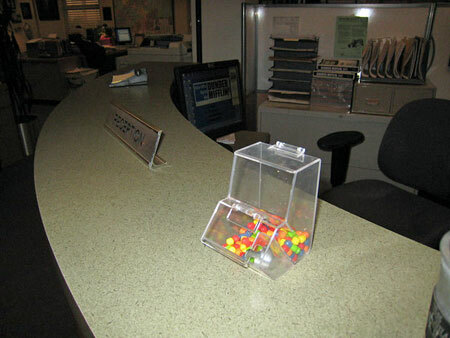 I am going to California March 11-15 and my entire mission is to visit the Office set. Please, oh please offer me your words of wisdom! ps-thanks so much for sharing these! They’re so much fun! Your website is the best! That looks like the best day ever! And you got to cuddle with everyone. Awesome, thanks for sharing. Im even gettin excited looking at these photos!!!! you are one luuuuucky girl! SOOOO jealous!!! Great job on all the pics and thanks so much for sharing! Those are amazing pictures. I actually got a little teary eyed on your behalf. How dorky am I? You look great with the cast…like you totally fit in. I am glad all the work you do on behalf of us fans paid off for you a bit. wow, a ton of pictures. This is awesome. Sounds and looks like a great visit. Loved the photos and hopelessly jealous. I was surprised at how detailed and on-character the desks are – I’m guessing this really helps the actors get into their roles. Ironic: Toby has a degree in Psych and yet understands no one. Ironic: Stanley is perhaps the most laid-back person on the planet and yet clearly drinks a tonne of coffee! Weird. I think it’s cute that they all have pictures/photos on their desks. Does Michael have any photos on his desk? Does Ryan or Kelly? You are so lucky!!! What a wonderful experience that you and Kathy had. Thanks for sharing it with all of us in such detail! I never knew that Roy’s last name was Anderson. This means if Pam and Roy got married and she took his last name traditional-style, her name would be Pam Anderson. Just thought I’d share, though I bet you guys caught that one long before I did. SPOILER clip from Scarborough on set. go to the video. AWESOME AWESOME AWESOME! Congrats again, Tanster! I’m even excited about the pictures! These are so great, thanks so much for sharing! It really was the Best. Day. Ever. Awesome! That close-up of the whiteboard was hilarious. Thank you for sharing. I couldn’t stop grinning at all of your pics! I am so totally jealous of your tour. That picture of Steve made me say “awwwwww” I just LOVE him! Thanks for sharing! YOU ROCK! that is greatt! i loved the pictures. i wish i was you! The meticulous attention to the desks is remarkable, especially since we most often see the stuff in passing, just to add to the sense of authenticity. Sometimes larger props, like the infamous blue ornaments on Jim’s desk in the Christmas episode, provide a some subtle humor but these little details amaze me. I wonder if the minutiae helps keep the actors in character. Whose picture is in the photo frame that is face down in Meredith’s bottom drawer? Is Toby the only one who subscribes to a clean desk policy? Uncluttered desk = uncluttered life? OMG you met CREED! Oh you lucky gal. I am so jealous. I adore him. I’m perfectly serious. He steals every scene he’s in. And I love that picture of him taped to the door. Can’t wait to figure out what the caption says. Thanks for sharing these amazing photos. Since I work in the real-life corporate world, my comment…. A clean desk = Something to hide. Sorry to post again but the Toby pics have picqued my curiosity. His diploma says he has a degree in Psychology from California Coastal College. So, Toby’s a California guy transplanted to Scranton? No wonder he’s mopey. It also makes his final line about his quickly dashed dream of moving to Costa Rica and learning to surf (“Branch Closing”) especially pathetic. Just for fun, I googled California Coastal College and came up with California Coast College (now University), which specializes in distance learning. 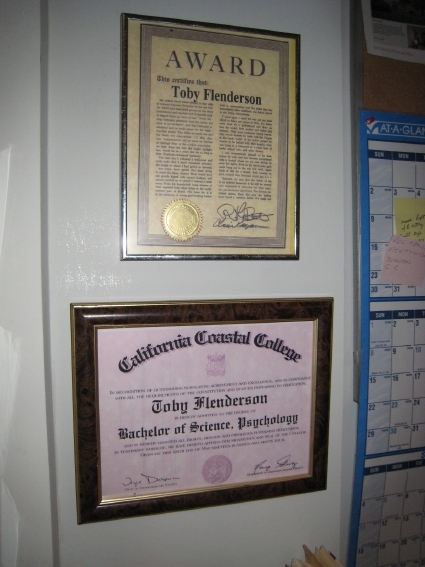 Is Toby’s diploma some kind of a shot or shout out to that institution? This is soooo cool!!!! Thanks for all the cool photos! Wow! They all seemed so nice to let you take photos and hang out!!!! That picture of David Denman makes me laugh everytime I scroll down the page! Ha! It’s the picture from his DUI! Hilarious stuff! Can’t wait for more of your tour! I don’t get why so many people don’t like Karen. looks like you had a great time. good to know everyone that works on the show treated you well too. How hard is it for an ordinary person to get a set tour? Awesome Pics Tanster!! Loved looking at them and I am among the many who are completely jealous. But how many cups of coffee does Stanley drink in a day? I think I counted 3 mugs, one cup and maybe a fourth mug in the background behind his monitor. Wow! Did anyone notice Dunder Mifflin’s return address on Roy’s paycheck? Slough Street, Scranton, PA? Obviously a nod to the BBC Office’s location: Slough, England. Touches like this are one of the many reasons I just love this show! Awesome work on all the photos, Tanster! Soooooooo jealous!!!! What an amazing opportunity for you and Kathie! Maybe I better think of starting a website…thanks for posting! Creed’s picture caption says “Ni Hao”, generic Chinese greeting that could either be translated to “How are you?” or “How do you do.” or just plain “Hi”. It literally means “You well”. Creed speaking Chinese is comedy gold I tell you. No pictures of the episode’s writers, gene and lee?? WOW! I cannot believe you got to meet Steve Carell, just thinking about it makes me want to pass out!! Uck. Toby. I hate.. so much the things about what you choose to be.. Haha best line ever! -RC or Hotwheels cars on Stanley’s desk! -The AIM window open on Karen’s desk. -The picture of Sasha on Toby’s desk was switched. In Hot Girl the picture was of a girl with black hair. Then when Sasha came in for TYDTWD she was blonde. -The entire sweet, adorable cast!!! So the office is filmed where? ok it’s 10 years (gulp) since this set visit by tanster and I never saw them until now! I had seen those since the Company Picnic but never saw these, these are a brilliant view.